My pond is 11′ x 32′ with a 2-3′ wide stream waterfall combination. It’s home to 3 larger Koi, a bunch of smaller Koi & 3 red eared sliders. Linda sent us photos of her beautiful showcase pond that inhabits koi and turtles. They rescue turtles and use this pond as their transition home. She told us that she raised her children around the pond and it is staple of their family tradition. We are so pleased to hear her results after using Nualgi for a year and love the photos she sent on our website. 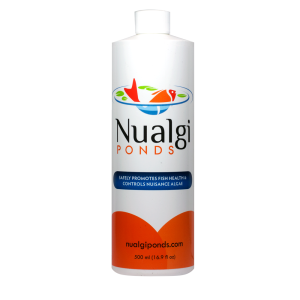 Pond-S-scapes LLC in New Mexico does maintenance on about 20 ponds each month and sells Nualgi because her clients love it. We are so proud of how we help keep her clients and fish families be very happy with the health of their ponds. May 18, 2017 – We’ve used Nualgi in our pond for the past year. May 18, 2017 – So little with such great results. “Here is our pond with an overload of Koi & three turtles. Everyone is very happy with the way the pond looks. May 22, 2017 – Our 3 Pond Turtles. November 1, 2017 – No fish issues! By restoring missing nutrients, bring balance to the natural marine food chain from the bottom up by promoting the growth of diatoms and zooplankton.